Donor walls of all types, and discussions of things that might be interesting. Posted on January 30, 2013 by rcbawards Tagged donor recognitionDonor Wall Best Practice	CommentsNo Comments on What material is used in a donor wall? What material is used in a donor wall? Glass can be the dominant material used, or it can be used as just an accent piece. 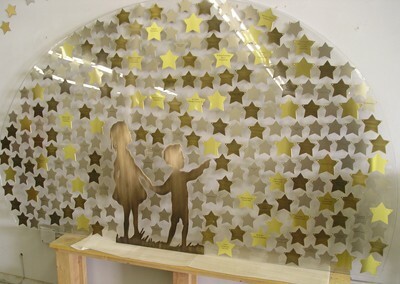 Depending on the installation, the glass can be illuminated, allowing the etching to glow. This impact is pretty cool. The LEDs are installed along the edges of the glass, with light going inside the thickness of glass, which creates an effect where the etched information actually glows while the rest of the glass is neutral. Acrylic can also be etched, but doesn’t have this type of flexibility. Both materials can be used to create a display with an acetate film or poster printed with graphics and names, that is placed between two sheets of acrylic or glass and held off the wall with aluminum standoffs or sign posts. This makes the display appear to float off the wall. A bit of an old school approach, this works well with displays that have a series of names, but where few are added each year. 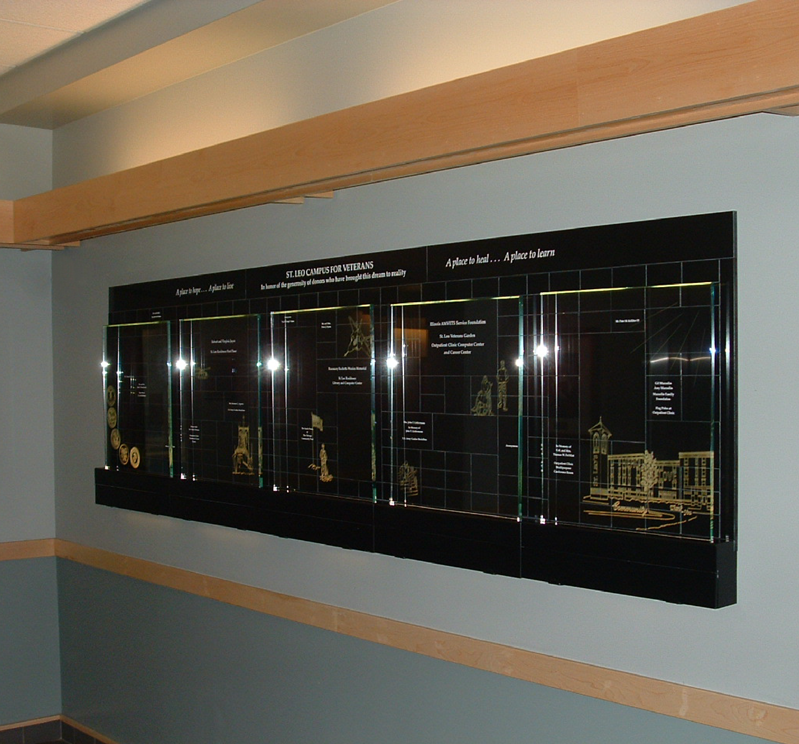 For example, we installed the Malcolm Baldrige Award for Quality using a channel display. Each year one new winner is announced and a new plate is engraved. 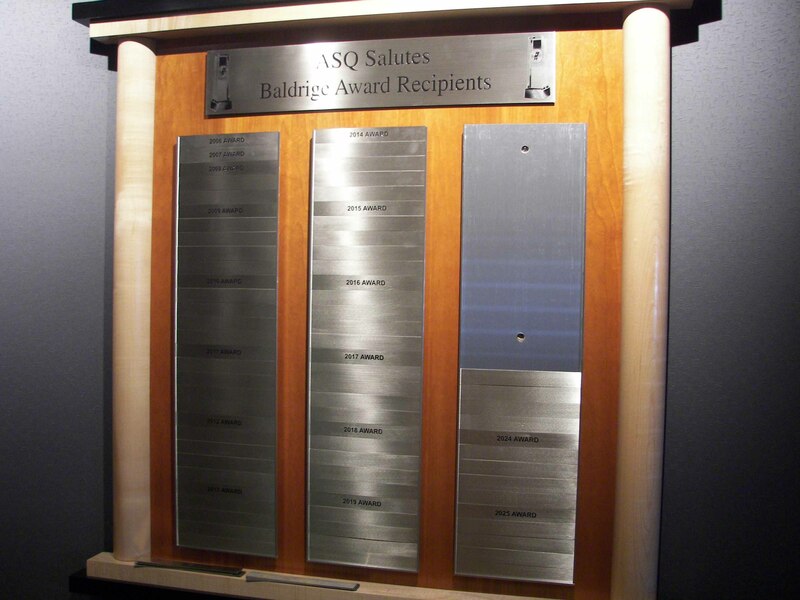 They have been administering the Baldrige Award for Quality since the 1980s, awarded by the U.S Commerce Department. This award is administered by the American Society for Quality in Milwaukee, Wisconsin. Plates slide up to remove and engrave, and can then be slid back into place. The wood design matches the front entryway and all the custom furniture in the reception area. Touch screen digital displays have a lot of appeal because they can be updated as often as necessary, they can tell the donor stories in the actual words of the donors, and are more impactful as potential donors explore the display and picture their contribution being reflected. If you have lists of hundreds or thousands of names, it simply isn’t practical to engrave brass plates every year. If the display is never updated, then it becomes stale and loses interest for the viewer. A good interactive display also incorporates a design around the display that attracts the viewer. If it is just a monitor, it seems to not be as strong. Its also great for conveying lots of information in addition to just donor lists. This might be video of the presidents message, a local rss news feed from the website, weather, a calendar of events, how to give, alumni opportunities and more. Think counter-top, that same stuff can also be used to create really cool displays. The material is easy to cut, easy to engrave, color-fills nicely and all around, is a great and long lasting material for a display. The material can be beveled, is able to be cut to any size and really makes the names pop out. 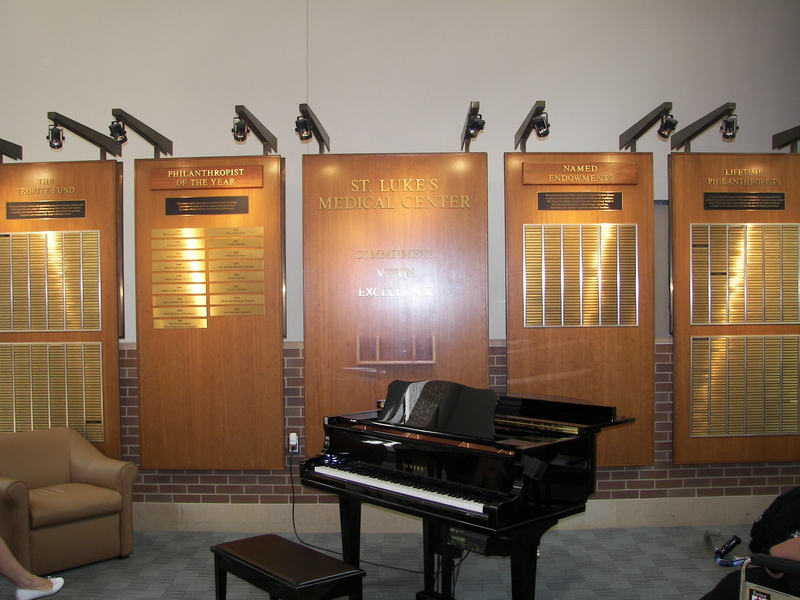 This example of a traditional donor wall uses several sizes of brass plates depending on the amount of the donation, and large hardwood walls highlight each group. The traditional brass plates on wood convey a warm and friendly feeling. Large or small, it is a classic look for a donor wall. The plates can be added each year as wall space or channels allow. This display uses both. Donor gifts can run all across the board, with a lot depending on the cost that you want. A simple plaque will often accomplish what is needed, but sometimes you need to reach a little farther. 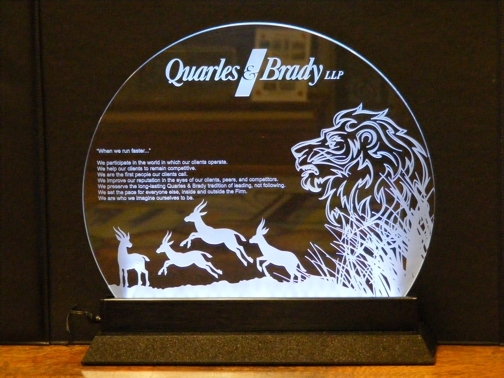 This etched display stands out, is illuminated, and makes a cool statement to the recipient. The LEDs are in the base, and shine upward, catching the etching and making it glow. 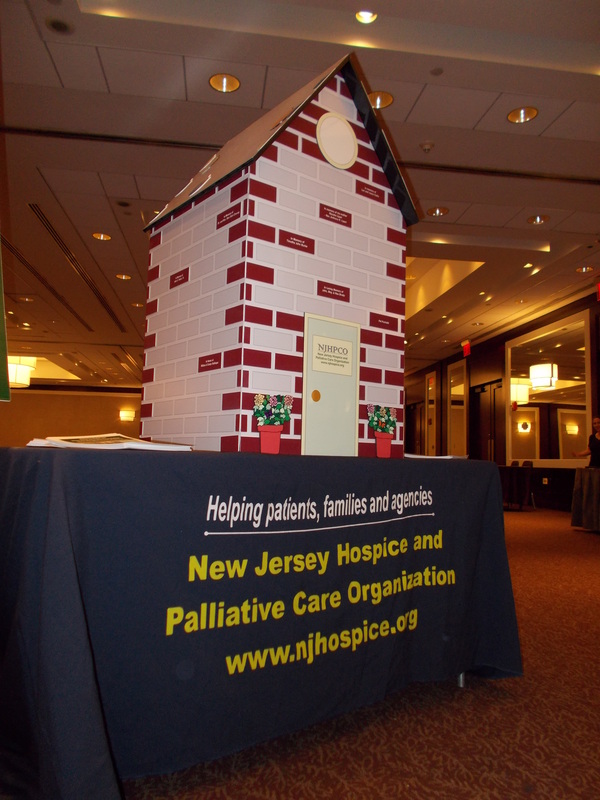 The traveling Hospice House Donor Wall folds in half for traveling from location to location. It is used for awareness and to generate funding for the organization. The building bricks and shingles are engraved with the donors names. Almost 6 feet long, this donor wall boasts 250 plates. 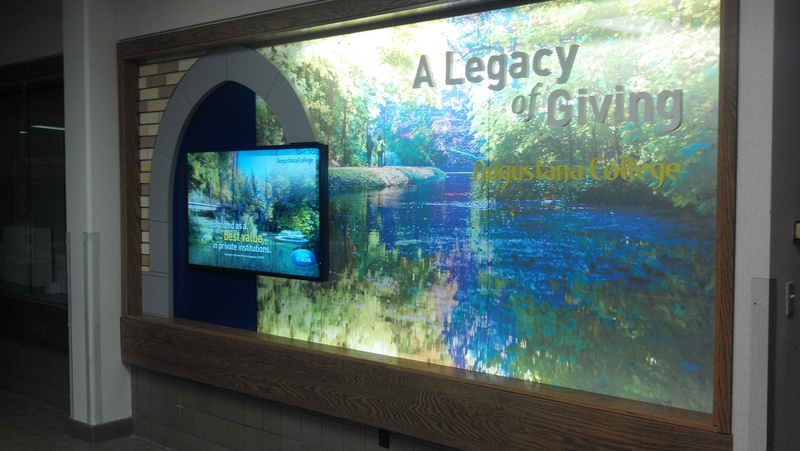 This interactive video donor wall has over 25 unique menu options, video and is easily up-datable by staff. A 55″ touch screen monitor comes to life with stories of individual donors, a video about philanthropy by the President, and even has a fun college quiz that everyone takes, testing their knowledge of their alma mater. This multi stage sand etching looks 3 dimensional, sits in a luminated base. Perfect for a gift to a donor. Completely custom, can have any design put into the glass. 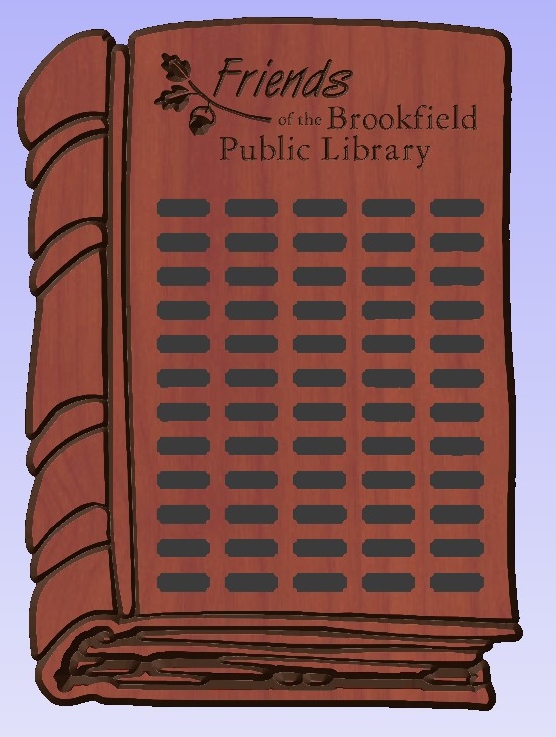 This 60 plate donor wall was created for the Friends of the Library. It is made of a single piece of wood, and cut to look like a book. The size is approximately 32 1/2″ x 24″. Lost or stored recognition pieces? Method of tracking gift giving information? Aesthetic organization of plaques and displays? Is the message consistent? Continuity and theme? Do you have a face of philanthropy that you present to the world, a consistent look to every recognition component? Do you follow your organizations branding standards consistently? Do you need amendments for recognition? Policy and structure pertaining to recognition? Include architectural plans with numbered locations for all donor recognition components that are used for coordination and record keeping. Prioritize what needs to be updated. Notes need to include what works well and what doesn’t, to facilitate future recognition coordinators. Are there any refurbishing needs? Can any plaques or plates be returned to donors? 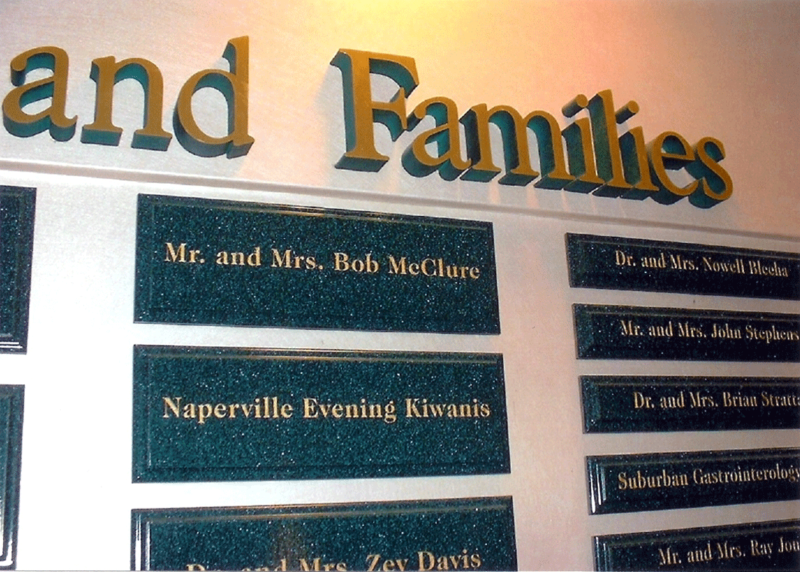 What about a re-dedication ceremony for refurbished plaques and donor walls? Everything needs to be coordinated according to Size, Content, Materials and Placement per gift level and type. Why is a plaque proposed for this type of gift? Is the plaque intended to be permanent? Who will be honored – How many people? What giving levels? What wording will be used? How will the plaque or plaque system be funded, and if necessary, be maintained? Who is paying for it? Policy determining look, location, price and relationship to other wall items such as art and awards. Budget policy for future awards is established. Establish an authorization flow chart of gift acceptance rules and recognition so that everyone is on the same page. Require concise, convenient documentation from all product suppliers to ease and expedite the re-order process. Must include date ordered, size, material, personalization method and who installed. Examples for future benefactors, for them to see how they might be treated and recognized. Checks are written every day in support of a multitude of causes, and all people want is a word of thanks. How do you recognize your donors? Take a look, see what grabs your attention, and let’s talk. We will help you create your unique one of a kind donor recognition program, that will serve as a thank you to those that have given, and a welcome greeting to those that might. Most important, we help you tell your story to the world. Provide ideas to stir the creative juices. Get you thinking about what might be. 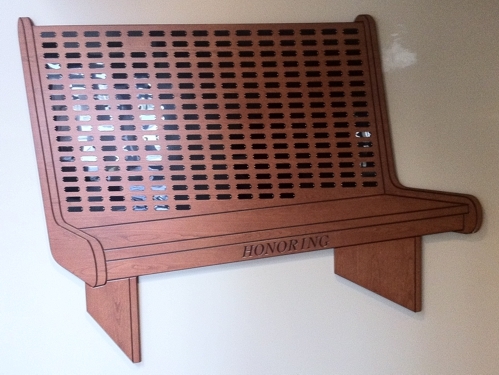 Design a traditional recognition wall; one that is wood framed with brass name plates. Design very contemporary donor walls; with metal, glass and acrylic components. 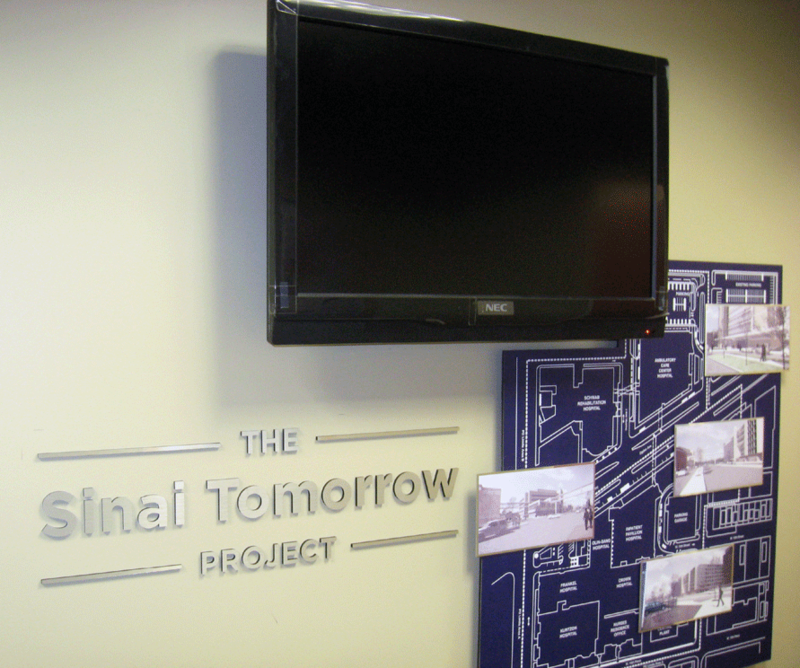 Design state of the art, cutting edge technology donor recognition; with donor walls that are integrated with a touch screen video display so each major donor, in their own words, can tell their story of why giving to the organization was important to them. What style suits your needs for recognition? Your campaign’s success will depend on planning and a sound recognition policy. Independent experts can help you with this. Contact Maureen Schuerman, CFRE or call 414-510-1044. She is a Milwaukee area consultant working with fund raising professionals. See also Robin E. Williams Inc. at 404-872-7646, or their website at: Robin E. Williams Inc. They help design total donor recognition solutions. They are in the business of helping you. We believe that the more information you have, the better a job you can do of planning and achieving the result you seek; a donor recognition program that continuously draws more donors. Take a look at the tabs for TRENDS;and DONOR RECOGNITION POLICY;to see if your thinking is in line with ours. This site is dedicated to the non-profit organizations, academic institutions and healthcare facilities, to offer ideas that can be used in donor recognition. Posted on December 7, 2010 by rcbawards CommentsNo Comments on How much is that donor wall? How much is that donor wall? You have to know, right, in order to move forward? You have to know, in order to plan a budget? So, how much is the donor wall going to cost? Do you build it now, in the hope that you will raise enough funds to cover the fund raising goal as well as pay for the expenses of a donor wall? Do you wait on determining how much you want to spend on the donor wall until you see how much has been brought in from fund raising? These are all tough choices and I really don’t think there is a firm answer. Every situation is going to be different. My suggestion is this: Look at your goal in fund raising and the length of time you will spend on reaching that target. Determine what you are comfortable in spending, 1% of the total, up to 4% of the total. Build your donor wall right away. This way, when prospective donors come to your facility, you can tell your story about how they can help you, and you can finish with showing them how they will be recognized. The real thing always makes a better impression than a piece of paper or an “imagine if you will” scenario. Use your donor wall as part of your marketing effort. Let it be part of your story that you tell. The Donor Wall Planning Guide is a tool from the AFP library for those in Donor Relations looking to add a Donor Wall and are not quite sure how to go about it. Is this the first donor wall you are involved with? Are you tasked with building a donor wall but don’t have any experience? This donor wall planning guide found in the AFP Info Exchange Library is a tool to help you get organized. The donor wall planning guide walks you through different scenarios about what you should be thinking about and questions that you should be asking.